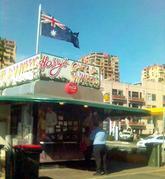 my first stop in sydney was to harry's cafe de wheels to get a hot dog de wheels. it's by far the strangest dog i've ever had. the dog itself is less firm than the all-beef dogs i'm used to in chicago - this had a texture like a knackwurst. it's served on a plain hot dog bun, and then topped with garlic onions, chilli con carne, cheese, chilli sauce, and mushy peas! yes, mushy peas! it's a challenge to eat in and of itself - you can see from the photo it's served with a fork, but when you add a blustery day and no tables, it becomes a logistical nightmare to get this dog into your mouth. regardless, i found a way, and man, i'm a fan of mushy peas on hot dogs! harry's is right on the water in wooloomooloo and next to the w hotel where russel crowe apparently spends his time. 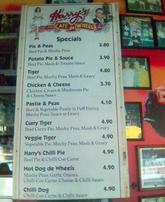 i plan on making another trip to harry's to try a curry tiger before i leave. i'm heading back to sydney in less than a week, and i was curious about my seat on the +20 hour flight on Quantas. well SeatGuru.com to the rescue. 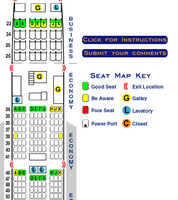 i'm in 36a. no way, jose. i've gotta get that changed.